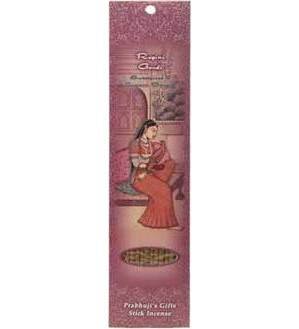 This aromatic stick incense attracts positive energy with its distinct notes of sweetgrass, a fragrant perennial that flourishes in the moist soil of India. Artistically blended with the Oriental fragrance of exotic flowers, a bouquet of floral scents fills your space, creating the romantic mood of deep longing for a loved one. Ragini Gaudi is the personification of an ancient Vedic melody filled with the longing of unsatisfied love most strongly experienced when the incense is burned from 8"10 am, though it can be thoroughly enjoyed any time. Ragini Gaudi is the wife of Raga Megha, capable of evoking the Indian monsoon with clouds, thunder, lightning and rain. A ragini is a female raga, an ancient melodic form of Indian classical music played in a certain scale of notes with its own melodic form and associated mood. The ragini is always played or sung after its raga, or husband, with its composition reflecting the tantric elements of the male and female energies. Together the static and dynamic energies create mood-evoking music. Let the distinct atmosphere of this meditative and contemplative ragini fill your space, touch your spirit and inspire your mind.